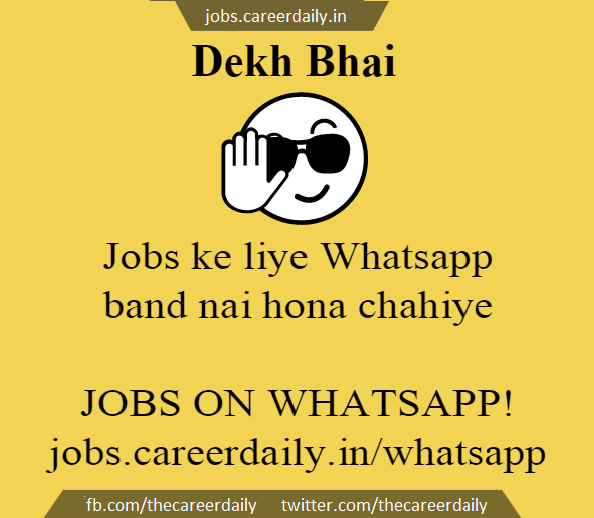 CareerDaily.in Jobs Portal Sarkari Naukri सरकारी नौकरी Government Rojgaar Samachar In India 2015: Job Alerts on Whatsapp! GOVERNMENT AND PRIVATE JOB ALERTS ON WHATSAPP! Save this number to your phone and check in Whatsapp. 1. A confirmation email will reach to you as soon you fill up the subscription form. 2. The form is to help you to subscribe appropriate type of alerts which we send to our subscribers. 3. We respect our subscriber's privacy and don't send spam messages. 4. Though we try to help you in the process but will not be able to answer all your queries asked through whatspp. 5. Alerts will be sent to you when new jobs are available on website. 6. To unsubscribe from alerts simply send a Whatsapp message writing "Unsubscribe" to us. Want To Get Career Daily JobAlerts In Email? On Mobile/Tablet long press on the image for download options. On Desktop simple press right click on the image.